Using Geocode Factory's gateway plugin you can associate any GPS Tools track and display it as marker (and track) on a map. 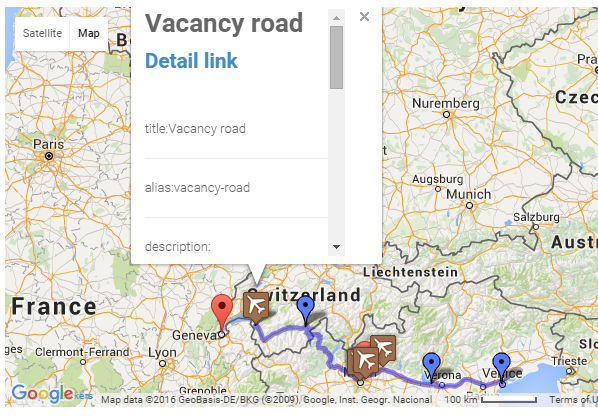 Introducing first ever community oriented Maps, Tracks & Sharing tool for Joomla. GPS Tools allows your users to submit GPS tracks and discuss. It supports GPX, KML formats of GPS tracks and can be integrated with popular social networking tools like JomSocial, Community Builder etc..
To use the GPS Tools Geocode Factory 5 gateway plugin you MUST have the GPS Tools component installed!